This cover/coverlet set is great. The color ivory is perfect and the fabric is soft, with the embroidery on the top. It has a buttoned opening and ties of each of the 4 corners.It comes with 2 beautiful shams and a pillow. I would highly recommend this! Madison Park Mansfield provides a traditional new solid look to your space. The 2-in-1 duvet cover/coverlet has a quilted top and button closure providing the option to use as a lightweight coverlet by simply buttoning up the bottom or fill with a comforter insert for a warmer option. I purchased this duvet set in King size and I'm in love with it! Of course, it doesn't hang to the floor as shown in the picture as I'm sure they've put a king size set over a queen or smaller bed. But it still hangs nicely over the sides of the mattress. The weight is fantastic. I LOVE blankets that have some weight to them and this quilted duvet doesn't disappoint. As an added bonus, if I want to remove my feather comforter from the duvet it's still a fantastic coverlet on hotter nights. 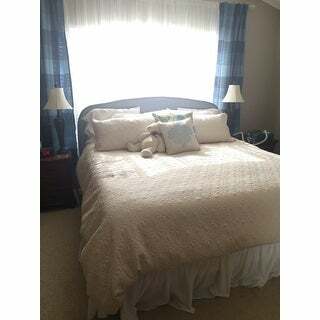 The duvet does have ties on all four corners to hold the comforter in place inside and the shams look beautiful. It's a perfect shade of ivory. Not yellow which I was worried about when ordering online. The back of the duvet cover/coverlet is wonderfully soft against my skin and makes me never want to leave my bed. The thread used on the throw pillow goes from blue to teal depending on the lighting and is beautiful either way. I'm so happy with this purchase! If you like a heavy weighted blanket than this set is PERFECT for you! If you're on the fence, but it. You won't regret it! It's a beautiful ivory color. I love the look. The reason that I did not give it 5 stars is because the inside of the duvet cover is silky, the duvet slides down to the bottom of the cover. As a result, sometimes it looks a bit frumpy on the bed. I’ve had this duvet cover for two years now and I haven’t used it for about a year. It really is beautiful but it is very difficult to keep it on the duvet. It has a silky back which makes it slide all over the duvet. It looks great, it’s just not very practical for a bed that gets used everyday. This cover is indeed ivory. It does not hang as long as pictured. Buttons are well secured. The underside fabric is an unknown fabric that is somewhat slippery. Not sure if this duvet cover or the down comforter inside of it (also reviewed by me) is the cause of the comforter not staying in place, but rather all slipping down to the bottom. Being king size it is difficult to shake everything into place. this is a great cover. I have had it for about a year now and have washed it many times and it has not faded nor has the threading come off or has lost any of its quality from the first day very well worth the price . The duvet is great quality and a perfect weight with or without ( during the summer) a comforter! However, I wasn't fond of the pillow with the painted pattern included. I won't be using this. If you don't want two sheets sown together to cover your comforter, you will love this product. I always feel like my bed is made when I pull it up in the morning and put the shams and the coordinating pillow on top. My only objection is it is a little heavy and as a result it creeps off the foot of the bed. Beautiful and very silky to the touch! I love mine. My cats love it even more, lol. Good thing it launders very well also. After repeated careful washings (cold water, gentle cycle, air fluff in the dryer (no heat) - it still looks and feels like it's brand new. Very warm and really soft to the touch. Looks pretty as well. This looks great but I pulled filling out as it would stay in place. I use like a bed spread. "When will this be back in stock? Looking for a queen set in ivory. Thanks, Kim"
Unfortunately, we do not have a time frame for restocking. Please enter your email address on the product page and we will notify you if it comes back in stock. "Does this come in a King?" I'm sorry king is not available at this time. Please check back soon. "What are the dimensions for a Full/Queen?" The Full/Queen is approximately 90" L x 90" W.